K.O. may one day be the greatest hero but for now, he’s the greatest fanboy. Created by Ian Jones-Quartey, OK K.O.! Let’s Be Heroes! is the latest Cartoon Network original series to launch in Malaysia. 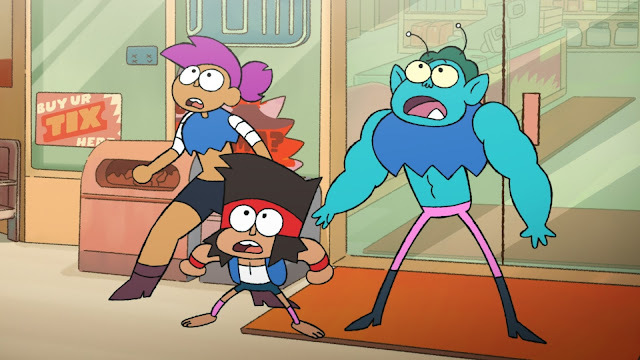 Premiering this Saturday, 20 January at 11.00 am on Cartoon Network (Astro Ch 616), the show follows K.O., a brave kid living in a video game inspired world filled with superheroes. Being the young fighter that he is, K.O. tackles everything with his cheery, endless enthusiasm, including his job at Gar’s Bodega in Lakewood Plaza, a one-stop shop for all heroes. In K.O.’s eyes, every person is a hero to look up to, every challenge is a chance to grow stronger and every success or failure is just another stepping stone to becoming the ultimate hero. While you watch, try out your own super radical moves against the evil Lord Boxman in the accompanying mobile game, OK K.O.! Lakewood Plaza Turbo is available for free on Google Play and the App Store. To celebrate the premiere, Cartoon Network will host a one-month Watch & Win Contest on Facebook from 23 January onwards for three (3) lucky winners to take home a range of goodies each week! Like the Cartoon Network Asia Facebook page to stay updated. Plus, the fun and excitement does not stop there! From 27 January onwards, fans can also show their love for their favourite OK K.O.! characters by joining Cartoon Network Asia’s Sketch Saturdays by submitting their drawings for a chance to be featured and credited on the official page - find out more on the Cartoon Network Asia’s Facebook Page. OK K.O.! Let’s Be Heroes premieres on Saturday, 20 January, at 11.00 am on Cartoon Network (Astro Ch 616). For latest updates, visit CartoonNetworkAsia.com or the Cartoon Network Asia Facebook Page.